OMG!! They look so good together and DKS looking at MR like that, even though we cant see his eyes, is sending everything of love, infatuation, admiration and contentment of being with her. And he is already thinking of future proposal to her... my inside turns into jelly just hearing those words. Silent lurker here. I followed this drama since episode 1 and like you all, anticipated for every friday and saturday. OMO, it is coming to an end. So sad. I was going to post earlier but somehow getting login page issues. Anyways, that's fixed and I'm here, when it's the finale of this show. I really love the characters and actors/actresses here. Hope they will get to work on other awesome projects together. I have a lot to say since I missed out on the discussion. ISH is really a good actress. The way she portrays MR, I do not think any other actresses can do the same. Her voice is really easy to listen to. I can see her progression from start to end. She's really coming into her own skin and stopped grading faces. MR-DS is a good match since they help each other through the struggles of life - the best of both worlds in friendship, family and love. I've honestly never even heard of CEW before or his idol group ASTRO which I just recently came to know. Man, this guy is all visuals from top to bottom. He outshines most, if I dare say, almost all actors and idol singers. That's subjective and my opinion only. For his first project, I approve 100%. As for today's daebak kiss scene, I expected less but they offered more. No complaints but clapping for me. If any of his fans are against it, I don't understand why and don't care to even know why. That's what pains me to see idols acting cause they will always have to cater to some of the most craziest fans who think they own them. It's really dumb IMHO, like do they want him to succeed in the entertainment industry or not. So far the comments see good so I'm not worried about the so called age gap since it's not extremely noticeable. It is a learning curve for him and what better actress like ISH to be his first love counterpart, so what's there to complain about? WY is really a good friend. Man, I wish there was a guy friend who was like him. He's really understanding and patient. No wonder he has so many admirers since as HY, who has been fabulous as MR's awesome cool friend and the other short hair girl who gave him the funniest confession. I love their scenes to bits. This guy is really a comedian, I will definitely follow his new projects cause he's such a versatile actor. I can see him going big in the near future with his acting chops. And for SA, what a witch from start to finish. Her back story does not even make anyone pity her. Just because she feel a need to look pretty to gain acceptance and popularity, it does not make it acceptable to harm others the way she did. Eun was nice to care about her but with her type of personality needs more than that. Maybe at a psychiatric hospital would ring a bell. She honestly believes she is above it all and uses that as a excuse for her crappy behavior to put others down. Watching her fake self for the last 14 episodes was just pure torture - I was like, someone, anyone, call it out. Just because she had a poor experience with her "servant" friend does not excuse her from hating MR from the beginning just because she's pretty due to her plastic surgeries. It's MR's personality that takes her to good places and meeting good people but it's SA's rotten personality that makes her keep digging a deeper hole for herself and in the end, she's left with no one but herself to blame. Her hatred for MR is so strong that she's blindsided on everything else including friendship, trust and loyalty since most of her manipulations, schemes and tactics are self-taught. I'd love to be a minor extra character to step on SA like the cockroach she is...sign me up...I'll be the one to call her out on everything she's done starting from episode 1 so we can get an extra 15 episodes to focus on the progression of MR-DS's relationship and WY-HJ storyline. I loved today's episode cause it seems that everyone is slowly unraveling the colored snake that SA is and slowly releasing the sleeping monster deep within. One scene where SA was telling the coordinator that he doesn't like perfume and likes natural scent and not artificially made. Like why did you even sign up for the class to learn how to make perfume. SA is getting incredibly dumb or she''s just disoriented since so much drama is surrounding her. Her so-called friend JH is one of the worse characters and easily hated for all the right reasons. She travels where the tides flow, completely untrustworthy and will throw you under a bus without any hesitation. Who is she to say that DS has low standards when it comes to dating whom, why she is so nosy asking him who he's dating and instantly thinks its a celebrity. What kind of clueless and brainless student like herself gets accepted into any university? This is the exact type of person I would avoid in RL. JB was great to call her out as a weirdo in her own way. lol. love that *had to repeat a few more times. I cannot wait for the last episode. It will definitely be bitter sweet. Hopefully it ties in all the storyline so we get to see more lovey-dovey scenes from our protagonists and more karma coming to our antagonists. I hope at least we will see some long overdue apologies from mrs. snake herself. Stay tuned for the finale everyone!!!! @MarJo_Lei Those gifs from the promo are amazing! I need the episode to be here already, but I also don't want to say goodbye!!!! Same here! I’m sure after raving with tonight’s sweerness overload episode next We would be sad because we don’t have anymore episode to look forward to. @blossomz Loved your in-depth analysis of the actors and characters. I especially agree with you about ISH, CEW and Kwak Dong Yeon. When I saw the latter in Moonlight Drawn by Clouds, I would never have imagined he was 19 at the time. He really blows my mind as a young actor. Meanwhile, ISH and CEW are perfectly matched. He's still growing as an actor, but he was exactly the right fit for Kyung Seok and he added a lovely spark to the character. ISH really brought out the best in Mi Rae, too, and added depth to even the smallest scene. She also clearly helped her costar be comfortable enough with her to go further in his performance. 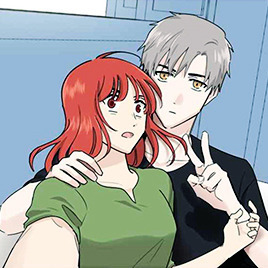 Sidenote: I'm really in love with these minor differences from the webtoon. First, the selfie from next episode. I love that its Mi Rae taking charge and surprising Kyung Seok. It's a nice way of showing that she's growing into her own and learning to love herself. We've seen enough of her being surprised by and then accepting affection, so I'm glad we'll see her initiating instead. Second, I love love loved how the kiss became about Kyung Seok showing Mi Rae how deep his feelings ran rather than MR teasing him after however many weeks of dating. A first kiss is a really powerful narrative tool, and they used it just right. But at the same time, I just noticed that the crazy camera angles kind of fit with the way the kiss was framed in the webtoon, kinda off-center and cutting off faces, so that's cool. Oh, my goodness! If they did that, I would be so thrilled. I feel like they've moved on from her dancing, but I haven't! We deserve a bookend dance, please. I'm newbie here and wants to say this I likeeee this drama I'm thankful finally someone say this social phenomena around sick society right now. I hope it will make more people aware of the dangerousness body, face, visual-shamming.. Yes he is sick... he just want to promote the last episode of the drama... He also mention about the back hug and he telling the fans don’t forget this drama... It feels like he is so attached to it that’s why he got sick???hmmm.. . Soo Hyang colored her hair something light red while Eunwoo is sick after the filming... DORAE couple misses each other? HAhaha... my delulu mind! Anyway, nice too meet you guys here and I hope today’s episode will exceed our expectation. I listened in too.. he was so sweet to do one while he was sick. Probably also probing to see his AROHA's reaction to the kiss episode hehe. Hope he stays healthy!! Looking forward to more sweet scenes in the last episode!! Happy ending for these 2 Maybe another kisseu too!! In their DDOCA Japan video Astro members were immitating CEW in his acting in Gangnam Beauty. Then they were laughing because he has so little lines at the start of the drama. There is nothing wrong with doing plastic surgery to give oneself confidence in themselves. I think the terrible way the people around her treated her excluding those who loved her like her parents and her friend Hyun Jung is an indictment on the society around us. You cannot change that overnight so she had done what she had to because society is not going to change and we place far too much importance on looks. Unfortunately the message this drama imparts though is that she was unable to develop any confidence nor feel she was worthy until she has had that plastic surgery. She was understandably traumatised, lacking self worth and the tools to handle her change of appearance as she is still extremely shy and won't change overnight because she got a pretty face. The fact she had plastic surgery being obvious only worsened her fear of rejection. The story cannot be told in any other way though because of how our values are unconsciously moulded each day. We can objectively look and think about something and say it is wrong but unconsciously none of us would want to have a face that others would reject. Nothing wrong with wanting to be beautiful either. Personally I have never rejected anyone for their looks but I have been attracted to a person because of their looks too. That is normal and I think it is in the DNA because nature requires us to want to mate with a better specimen to ensure survival. We fight that instinct as humans able to reason and think and pick good people over looks I hope ultimately. I am extremely happy this writer chose to let Kyung Seok like her before she changed her face because the message should be character before looks. The fact that he said he misses her old face was really such a sweet sentiment making her realise her looks were never what attracted him to her. What is the point of good looks when you have a rotten character like Soo A. Cast arrival to the wrap up party.